سروری, مرتضی, دیواندری, مهدی. (1394). رفتار جامد-مذاب-گاز در فصل مشترک کامپوزیت آلومینیم- منیزیم در روش ریخته‌گری گریز از مرکز. علوم و فناوری کامپوزیت, 2(3), 75-82. مرتضی سروری; مهدی دیواندری. "رفتار جامد-مذاب-گاز در فصل مشترک کامپوزیت آلومینیم- منیزیم در روش ریخته‌گری گریز از مرکز". علوم و فناوری کامپوزیت, 2, 3, 1394, 75-82. سروری, مرتضی, دیواندری, مهدی. (1394). 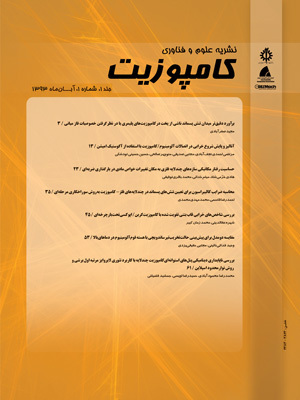 'رفتار جامد-مذاب-گاز در فصل مشترک کامپوزیت آلومینیم- منیزیم در روش ریخته‌گری گریز از مرکز', علوم و فناوری کامپوزیت, 2(3), pp. 75-82. سروری, مرتضی, دیواندری, مهدی. رفتار جامد-مذاب-گاز در فصل مشترک کامپوزیت آلومینیم- منیزیم در روش ریخته‌گری گریز از مرکز. علوم و فناوری کامپوزیت, 1394; 2(3): 75-82. کامپوزیت‌های آلومینیم- منیزیم در صنایع مختلفی مانند خودروسازی و هوا-فضا استفاده می‌شود. در این پژوهش نحوه رفتار جامد-مذاب-گاز و مشخصات فصل مشترک متالورژیکی در تولید کامپوزیت فلزی آلومینیم- منیزیم به‌روش ریخته‌گری گریز از مرکز عمودی، و عوامل تاثیرگذار بر آن بررسی شد. چهار دمای پیش‌گرم 30، 100، 150 و 200 درجه سانتی‌گراد بررسی شد. ریخته‌گری نمونه‌ها در سرعت دوران ثابت 1200 دور بر دقیقه و نسبت حجمی مذاب- جامد ثابت حدود 1 انجام شد. بدین منظور آلومینیم مذاب در دمای 700 درجه‌ی سانتی‌گراد درون استوانه‌های توخالی از جنس منیزیم، ریخته‌گری شد. نمونه‌های تهیه شده از جهات مناسب برش داده شده و با استفاده از میکروسکوپ نوری، الکترونی و پراش اشعه ایکس مورد مطالعه قرار گرفت. نتایج نشان داد که ترکیبات بین فلزی Al3Mg2، Al12Mg17 و ترکیب یوتکتیک در فصل مشترک تشکیل می‌شود. هم‌چنین نتایج نشان می‌دهد که محتوای حرارتی مذاب آلومینیم، با انحلال نقاط برجسته‌ی مرجح در سطح فلز جامد، به تشکیل مناطق غنی از منیزیم منجر شده و در یک قسمت مشخص بین جامد- مذاب متمرکز می‌شود. همچنین با توجه به حضور گاز یا هوا در سطح ناهمواری‌های جامد، واکنش بین مذاب و گاز باعث تشکیل حباب‌های گازی در فصل مشترک شده و سپس در مقطعی دور از مکان واکنش اولیه مشاهده می‌شوند. نحوه و شرایط تشکیل این حباب‌ها و حفره‌های گازی مورد بحث قرار گرفته است. Al/Mg composite have new applications in various industries such as car manufacturing and aerospace. In this work characteristic of metallurgical interface and the behavior of melt-solid-gas during production of Al/Mg composite via vertical centrifugal casting process was investigated Aluminium melt, at 700 oC and volume ratio of nearly one, was poured into a solid Mg rings preheated up to 30, 100, 150 and 200 oC, respectively while rotating at 1200 rpm, in a vertical centrifugal casting machine. After casting samples were cut and interfacial microstructure was studied by optical and scanning electron microscopes. Results show that the heat content of Al melt lead to dissolving preference prominent locations and creating local Mg rich regions. Study of the Al/Mg interface also showed that intermetallic compounds, Al3Mg2, Al12Mg17 are formed. Furthermore, gas pores may form, on notches present on the rough surface of the solid Mg ring, possibly as a result of melt/gas reaction. Possible states and conditions of the formation of bubble and gas porosity are discussed. Hoeschl, J. W. M., “BMW’s Magnesium-Aluminium Composite Crankcase, State-of-the-Art Light Metal Casting and Manufacturing,” SAE Tech. Pap., Vol. 1, No. 0069, 2006. Liu, P. Li, Y. Geng, H. and Wang, J., “Microstructure Characteristics in TIG Welded Joint of Mg/Al Dissimilar Materials,” Mater. Lett., Vol. 61, No. 6, pp. 1288–1291, Mar. 2007. Liu, L. Wang, H. and Zhang, Z., “The Analysis of Laser Weld Bonding of Al alloy to Mg Alloy,” Scr. Mater., Vol. 56, pp. 473–476, 2007. Klag, O. Gröbner, J. Wagner, G. Schmid-Fetzer, R. and Eifler, D., “Microstructural and Thermodynamic Investigations on Friction Stir Welded Mg/Al-joints,” Int. J. Mater. Res., Vol. 105, No. 2, pp. 145–155, 2014. Joseph Fernandus, M. Senthilkumar, T. Balasubramanian, V. and Rajakumar, S., “Optimizing Diffusion Bonding Parameters to Maximize the Strength of AA6061 Aluminum and AZ61A Magnesium Alloy Joints,” Exp. Tech., pp. 1–16, 2012. Han, S. and Huh, H., “Evaluation of a Cast-joining Process of Dual-Metal Crankshafts with Nodular Cast Iron and Forged Steel for Medium Speed Diesel Engines,” Int. J. Adv. Manuf. Technol., Vol. 63, No. 1–4, pp. 319–327, 2012. Hajjari, E. Divandari, M. Razavi, S. H. Emami, S. M. Homma, T. and Kamado, S., “Dissimilar Joining of Al/Mg Light Metals by Compound Casting Process,” J. Mater. Sci., Vol. 46, No. 20, pp. 6491–6499, 2011. Rübner, M. Günzl, M. Körner, C. and Singer, R. F., “Aluminium–Aluminium Compound Fabrication by High Pressure Die Casting,” Mater. Sci. Eng. A, Vol. 528, No. 22–23, pp. 7024–7029, 2011. Melgarejo, Z. H. Suárez, O. M. and Sridharan, K., “Microstructure and Properties of Functionally Graded Al–Mg–B Composites Fabricated by Centrifugal Casting,” Compos. Part A Appl. Sci. Manuf., Vol. 39, No. 7, pp. 1150–1158, Jul. 2008. Niu, L. Hojamberdiev, M. and Xu, Y., “Preparation of in Situ-Formed WC/Fe Composite on Gray Cast Iron Substrate by a Centrifugal Casting Process,” J. Mater. Process. Technol., Vol. 210, No. 14, pp. 1986–1990, 2010. Watanabe, Y. Watanabe, S. and Matsuura, K., “Nickel-Aluminides/Steel Cad Pipe Fabricated by Reactive Centrifugal Casting Method From Liquid Aluminum and Solid Nickel,” Metall. Mater. Trans. A, Vol. 35, No. 5, pp. 1517–1524, 2004. Xu, G. Luo, A. Chen, Y. and Sachdev, A. K., “Interfacial Phenomena in Magnesium/Aluminum Bi-Metallic Castings,” Mater. Sci. Eng. A, Vol. 595, pp. 154–158, 2014. Hajjari, E. Divandari, M. Razavi, S. S. Emami, H. M. and Kamado, S., “Applied Surface Science Estimation of theTransient Interfacial Heat Flux Between Substrate / Melt at the Initiation of Magnesium Solidification on Aluminum Substrates Using the Lumped Capacitance Method,” Appl. Surf. Sci., Vol. 257, No. 11, pp. 5077–5082, 2011. Sarvari, M. and Divandari, M., “Melt Behavior and Shrinkage Force Effect of Al Melt in Al/Mg Bimetal Cast via entrifugal Casting,” In Persian, Modares Mechanical Engineering, Vol.15, No.7, pp.131-138, 2015. Noguchi, T. Horikawa, N. Nagate, H. Nakamura, T. and Sato, K., Application of Flow and Solidification Simulation in Cast-in Insertion Processing,” International Journal of Cast Metals Research, Vol. 18, No. 4, pp. 214–221, 2005. A. S. M. International, ASM Metals Handbook Volume 3 Alloy Phase Diagrams. 1992. Huang Juan, Y. L. and wang, W.,“Interface Microstructure and Diffision Kinetics in Diffusion Bonded Mg/Al Joint,” Akadémiai Kiadó, Budapest Springer, Dordr., Vol. 95, No. 1, pp. 71–79, 2008. Guldberg, S.and Ryum, N., “Microstructure and Crystallographic Orientation Relationship in Directionally Solidified Mg – Mg 17 Al 12 -Eutectic,” Materials Science and Engineering, Vol. 289, pp. 143–150, 2000. Sato, Y. S. Park, S. H. C. Michiuchi, M. and Kokawa, H., “Constitutional Liquation During Dissimilar Friction Stir Welding of Al and Mg Alloys,” Scr. Mater., Vol. 50, No. 9, pp. 1233–1236, 2004. Dietrich, D. Nickel, D. Krause, M. Lampke, T. Coleman, M. P. and Randle, V., “Formation of Intermetallic Phases in Diffusion-Welded Joints of Aluminium and Magnesium alloys,” J. Mater. Sci., Vol. 46, No. 2, pp. 357–364, 2010.